Thom Singer has a diverse background working for Fortune 500 companies, law firms and entrepreneurs in various capacities. Thom believes that, in a world consumed by digital shortcuts, creating meaningful influence in your business community matters more than ever before, and that likes, links, shares and follows are not the answers to unlocking business potential. Human engagement is the key to success. With decades of sales, marketing, and leadership experience, Thom’s keynote presentations combine that experience with an entertaining storytelling style. As a professional speaker, Thom believes that there is no single thing that holds people back from achieving more, nor is there one solution to reaching the top levels of success and it is unique for each person. Thom is author of 12 books, as well as host of the popular “Cool Things Entrepreneurs Do” podcast, which was named on Inc. Magazine as one of 8 business podcasts to listen to in 2018. On the show he interviews entrepreneurs, solopreneurs, and business leaders from a variety of industries. He encourages his guests to share tips and ideas that can help those with an “entrepreneurial spirit” find their own path toward success. Thom earned the prestigious Certified Speaking Professional (CSP) designation in 2014. The Certified Speaking Professional designation, established in 1980, is the speaking industry’s international measure of professional platform skill. The CSP designation is conferred by the National Speakers Association (NSA) only on those speakers who have earned it by meeting strict qualifying criteria. The letters CSP following a speaker’s name identify that speaker as a speaking professional with a proven track record for understanding and delivering value from the platform. Thom and his wife, Sara, make their home in Austin, Texas and are the parents of two highly spirited daughters. After being a couch potato for most of his life, he is now an avid runner and completed his first half-marathon in 2017. 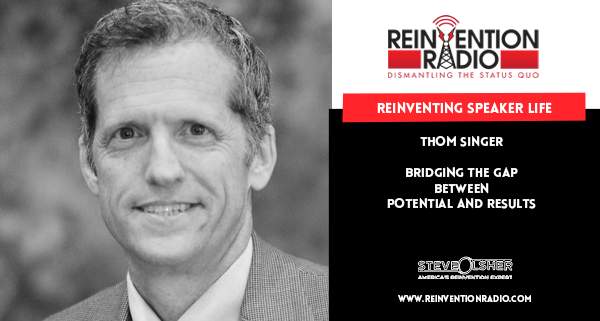 TUNE IN to hear Thom chat with Steve, Mary and Richard about life as a professional speaker and how Thom helps to bridge the gap between potential and results. Bill Clinton or Thom Singer? Reinventing Failure – In this episode, Jared Warner chats with Steve, Mary and Richard about his journey from having it all at 28 years old to having a net worth of $3 and how the taste of success is so much sweeter after tasting failure.